If you want your visiting card to create a lasting impression, it should really stand out from the pile. Even the first look, as well as the first touch should tell your new partner or customer that you are special. Original design, a bright image, and perfect quality print will help you here. The good news is that all of the above are now available to every business. You don’t need to hire professional design studios – Business Card Maker allows you to design your own business card in-house. Let’s see how it works. Step 1. 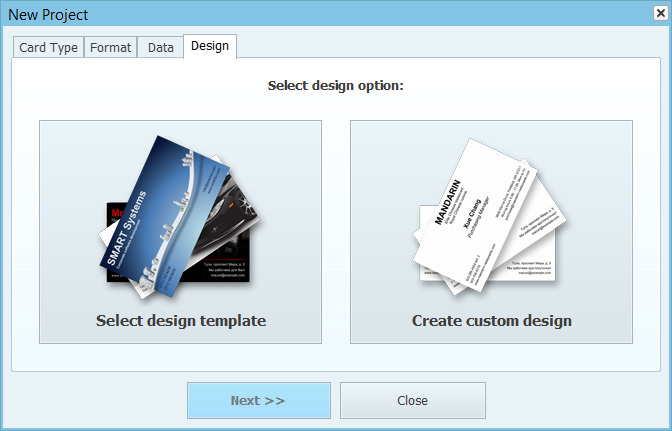 Install business card software. First of all, download Business Card Maker software and install it on your computer. The program has an intuitive interface, and a wizard will guide you through all the main steps when you create your first business card. Step 2. Create new project. Now, you should choose the type of your business card, e.g. a contact card of a sole trader, or a company card for promotion purposes. After that, set the format, and enter card data. Finally, you need to decide whether to use one of the ready-made design templates, or design your own business card from scratch. If you are in creative mood and want to do it yourself, click Create custom design. Choose the preferred layout of text blocks, and click Create card. Step 3. Add logo or picture. A corporate logo is a traditional element that adds color and style. A good quality photograph of your product, office, or staff members may also be a great extra design item. 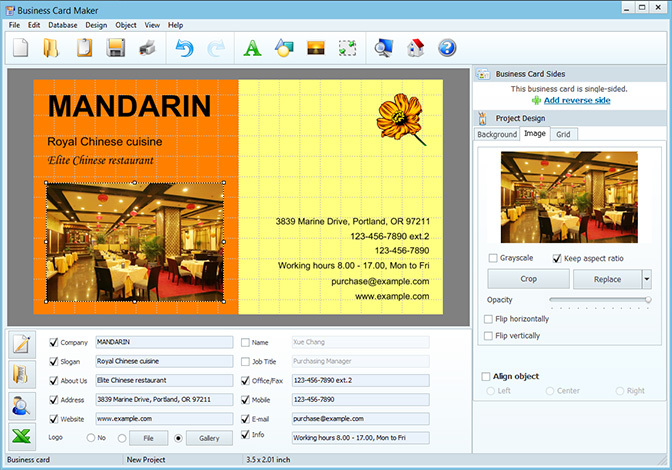 Business Card Maker lets you add a logo from your own file, or pick one from the built-in clipart gallery. If you want to add another image after adding a logo, go to Design > Add Image. When you design your own business card, remember one of the five golden rules for making business cards – keep it simple. Make sure the colors on the photograph match those on the logo, and avoid fancy background or fonts. Step 4. Adjust background and fonts. Business Card Maker lets you choose from various background designs: solid color, bicolor (partitioned or gradient), texture, image. For a business card with logo or photo, solid or bicolor background will be the most appropriate choice. Make sure the text is easy to read by choosing a font color that contrasts the background. You can pick a harmonious color scheme in Design > Fonts and Colors. Step 5. Print your business cards. When you’re happy with the design, save your project. You may want to reuse it for various reasons – for example, to design business cards in a different language if you intend to give them out to your foreign partners. Now, click Print to open the printing dialog. 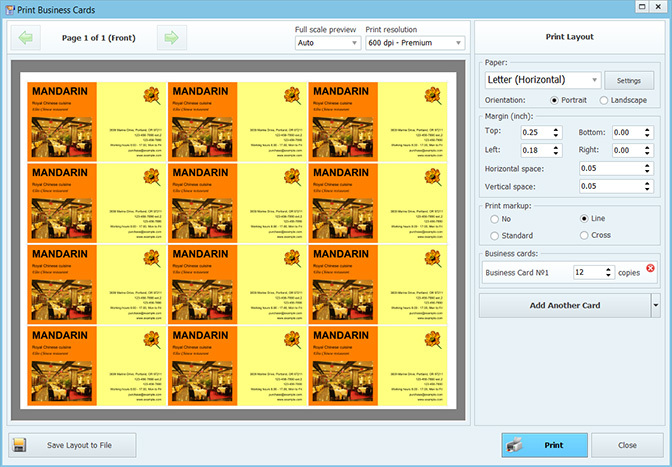 Here, you can select the paper size and the optimal resolution, set print markup and the margins. The program will fit up to 12 cards on a Letter page in the most economical way.